Phil shows off the football boots he’s donating to Team Rhino in Gambia upon his retirement after 34 years as a referee! Veteran local referee Phil Thompson has blown the whistle on his refereeing career after 34 years! Phil, Managing Director of local security company, Key Control Services Limited, on Manchester Road, Bolton, has been decided to hang up his boots and whistle after yet another a knee injury. He has had 12 knee operations during his lifetime of playing and officiating a range of sports. Phil, who turns 65 in July, started as a referee after being a player manager and then full-time manager in a local football league because there were so few referees. He quickly rose to officiate semi-professionally at matches across the North West, including those involving Manchester United and Bury FC. However, when he was promoted in his former career as a police officer, his refereeing career took a back seat due to commitments of policing. He continued to referee in local amateur leagues. Since then (in 1991), he has referee-ed in various local amateur leagues in the North West, including refereeing a number of cup finals. He is a former Chairman (twice) and President of Bury Referees’ Society and was also been involved in Manchester Referees’ Society for many years, prior. “When I was a manager I was always disappointed with the standard of refereeing, so I decided to take it up,” said Phil. 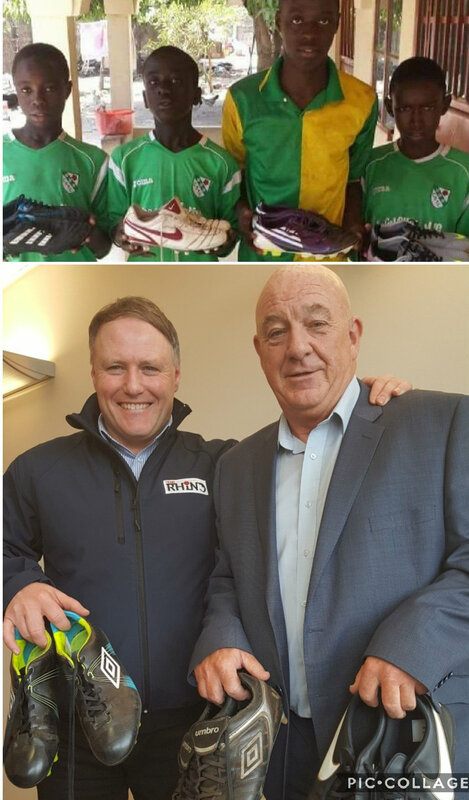 Phil has donated a number of pairs of boots to a charity overseas – Team Rhino in Gambia – as part of ‘retirement’. During his 34-year career as a referee, he has built up Key Control Services Limited which now employs more than 20 staff and turns over more than £1.1 m.
The company provides security services such as key holding and alarm response; open up and lock up; manned guarding (patrolling duties, CCTV monitoring and reception duties 24 hours a day, seven days a week, 52 weeks a year); mobile patrols and vacant property inspections to a wide range of clients including accountants, solicitors, commercial property agents and owners of sites under construction, industrial estates, business parks or even have sites that are affected by travellers. Clients include KIA Motors, Brother UK, Howdens Joinery, Williams BMW, Greater Manchester Chamber of Commerce, Buildbase, Amazon, Carrs Pasties, Barlow Andrews Accountants, Stephensons Solicitors, Clough & Willis, AFG, Yorkshire Bank, commercial property agents Longdon Cook, numerous golf courses, Runshaw College in Leyland, and East Lancashire Railway in Bury. Caption: Phil holds up his boots to mark his retirement as a local referee after 34 years and boys from Team Rhino in Gambia show off other donated boots.